As you will see, て-form (te-form) of Japanese verbs has many functions. You can use it to form different verb sentences. One basic function of te-form is to connect verb sentences. When two or more actions take place in succession, the actions are mentioned in the order of occurrence by using the te-form. It looks similar to the function of the English word "then". There is no past tense for te-form. The tense of the sentence is determined by the tense form of the last verb in the sentence. Meaning: In the morning, I eat bread, drink coffee and go to the school. Meaning: I went to the library, borrowed a book and went back home. 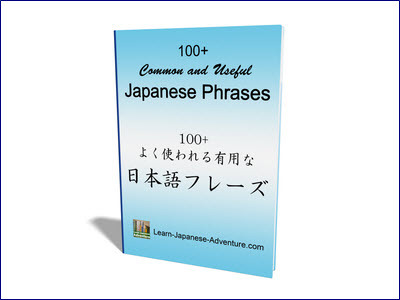 How to Make Japanese Verbs て-form (te-form)? Let's see how to make te-form from dictionary-form. For group 1 verbs which end up with the words う (u), つ (tsu) or る (ru), replace these words with って (tte). 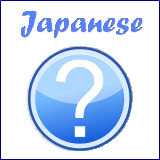 For those verbs which end up with the words む (mu), ぬ (nu) or ぶ (bu), replace the words with んで (nde). For group 1 verbs which end up with the word く (ku), change the word to いて (ite). For those which end up with the word ぐ (gu), change it to いで (ide). And for those which end up with the word す (su), change it to して (shite). However, there is one exception. 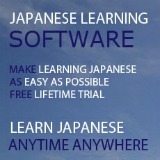 (In Japanese you always come across many exceptions). For the japanese verb いく (iku) which means "to go", the te-form is いって (itte). Group 2 verbs always end with the word る (ru), you just need to replace る (ru) with て (te). For group 3 verbs, the te-form of する (suru) is して (shite) and the te-form of くる (kuru) is きて (kite). 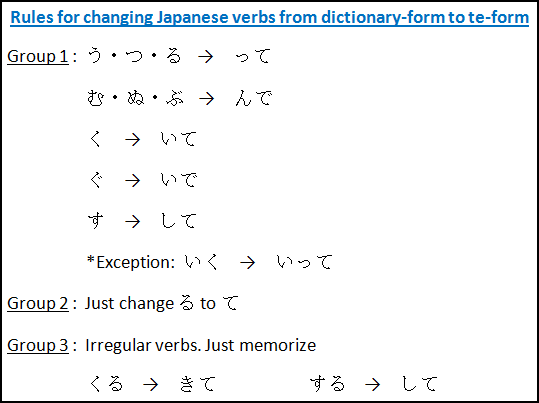 The following diagram shows the summary of how to change from dictionary-form to te-form for Japanese verbs. Let's see some examples of changing Japanese verbs from dictionary-form to te-form. You can make a sentence using te-form just like the above example. It is also fine to make a sentence with only two actions with te-from, as long as the order of occurrence is followed as mentioned in the sentence.